I was not 100% successful, but the attempt did have some positive results. The whole thing started with an ipa-server-install. As part of the IPA install, it records a couple of PKCS12 files with enough information to talk to your Dogtag instance. These are in /root, but I copied them to the /home/fedora directory to make them accessible via scp to my desktop. 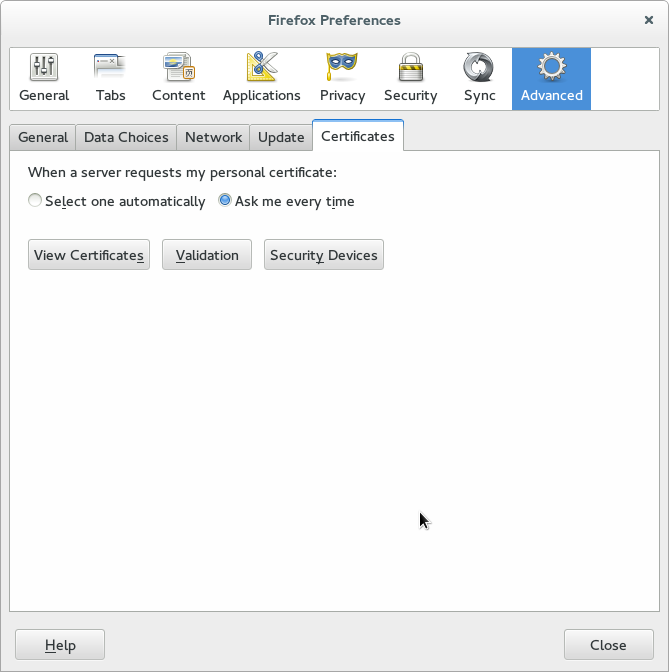 That will pop up the preferences dialog, and select the Advanced tab and the Certificates subtab. Click view certificates and then “Your Certificates” on that panel, and finally click the Import Button. Yeah, that is pretty hostile. I had to add the hostname and ip address for the ipa server int /etc/hosts for my laptop in order to get an https connect to dogtag, but I got it with: https://hostname:8443/ Note that it uses the certificates imported from ca-agent.p12 to connect. Or do something more permanent. 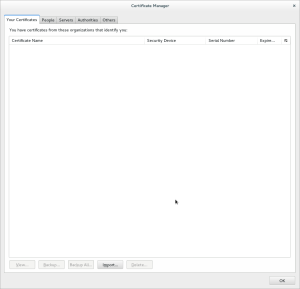 getcert request -c ipa-dogtag -s -f ~/.pki/ayoung.cert.pem -k ~/.pki/ayoung.key.pem -N "uid=ayoung,cn=users,cn=accounts,dc=openstack,dc=freeipa,dc=org"
Number of certificates and requests being tracked: 1. So it looks like the caUserCert profile does not accept a PKCS11 request, as it is set up to come from the Web Browser, and those use Certificate Request Message Format (CRMF). I’ve been able to hack around it (I think) but there is still more to learn here. lut 10 13:57:04 fedora.box.net certmonger: Request for certificate to be stored in file “/etc/pki/testcert” rejected by CA. The command issuing the request actually doesn’t give any errors. Accepting the request doesn’t make certmonger notice it. Is that some kind of known issue? having a location set for storing the private key. > lut 10 13:57:04 fedora.box.net certmonger: Request for certificate to be stored in file “/etc/pki/testcert” rejected by CA. > The command issuing the request actually doesn’t give any errors. Accepting the request doesn’t make certmonger notice it. for dogtag-ipa might shed some light on things. I figured out the problem with NEEDS_GUIDANCE – it seems certmonger doesn’t understand some responses from the dogtag correctly. I got proper responses, but certmonger got tripped by extra blank line somewhere. 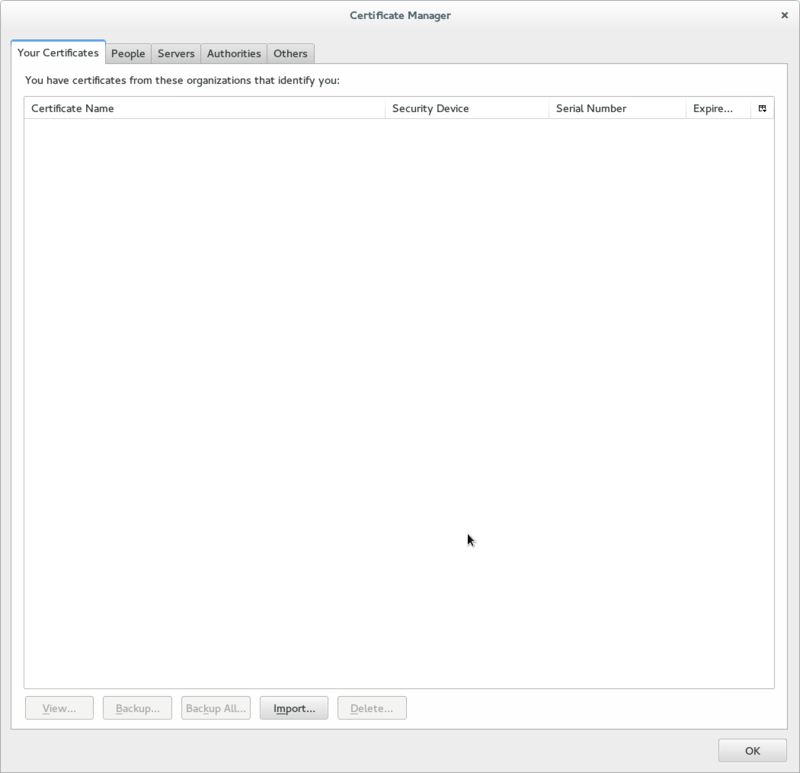 I’ve updated the setup, and now certmonger communicates fine with the CA instance, but this time it has issues fetching the certificate (again some parsing issues). Hopefully it will be fixed soon. The parsing logic was overhauled for certmonger 0.77, and there are additions to the more generic dogtag-submit helper coming in 0.78 to better support supplying the right information when the server profile expects the client to authenticate in some way. Just in case, though, if you’ve captured the server response, and can either add it to a ticket at https://fedorahosted.org/certmonger/newticket, or drop me a copy in email, I’ll likely turn it into sample data for the self-tests, because I’m keen on making it work for your case.